It has all been building to this: The first mega-battle between Godzilla—the 12-story tall, spike-backed King of the Monsters whose trademark bellow is as familiar as a commercial jingle—and an equally massive insectoid creature. They’re going to tear each other and a significant portion of downtown Honolulu to shreds, and we in the summer blockbuster audience have a front-row seat. So, of course, when we see the first moments of that epic confrontation, it’s going to be … when a little boy in the movie is watching news reports on a small TV screen. It’s hard to convey—in an era when we’ve been conditioned to expect the Michael Bay/Roland Emmerich-ization of the “event” movie—how radical Gareth Edwards’ Godzilla feels. Because this is a giant lizard movie with style, and a willingness to tease viewers on the way to the big finale. 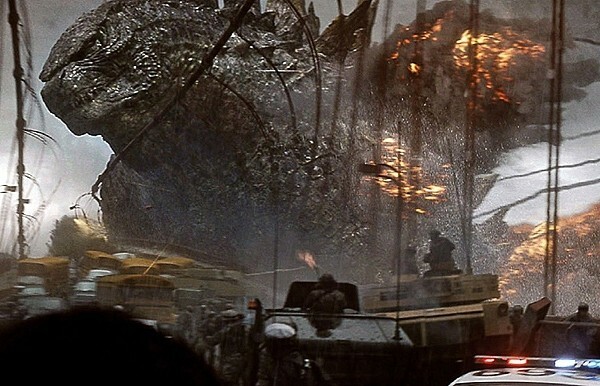 You’ll likely see reviews comparing Godzilla to the work of Steven Spielberg—and more specifically Jurassic Park—but that’s a compliment that doesn’t actually give Edwards enough credit for the unique way he approaches a movie that could have been churned off an assembly line without too many people noticing. That’s not to say that a certain part of the plotting doesn’t feel exactly that way. Screenwriter Max Borenstein—working from a story by Expendables scribe Dave Callaham—gives us U.S. Navy Lt. Ford Brody (Aaron Taylor-Johnson), who has a family history of tragedy involving a mysterious earthquake in Japan, and a father (Bryan Cranston) determined to get to the bottom of a conspiracy of secrecy. And, naturally, they discover that a quasi-government agency is indeed attempting to study a pod from which eventually bursts forth that mantis-like monster they refer to as a MUTO, which is an acronym for something but seriously, who cares what. The MUTO and its mate are destined to threaten Brody’s wife (Elizabeth Olsen) and son in San Francisco, because that’s what happens in movies of this sort, and Brody in particular has a talent for being exactly where the creatures are attacking at any given moment, whether it’s a secret lab in Japan, an airport tram in Hawaii or a railroad trestle in California. The material involving the human characters is somewhat perfunctory get-back-to-your-loved-ones stuff, but Taylor-Johnson is a far better audience proxy than the plastic Charlie Hunnam was in 2013’s Pacific Rim. And while there’s a bit of subtext here about humans’ arrogant sense of being able to control the uncontrollable—including a nice moment where something “safely” stored at the Yucca Mountain nuclear waste repository proves to be not-so-safe after all—this Godzilla doesn’t lean on turning its titular character into a massive, roaring allegory. Instead, Edwards chooses to keep his movie interesting by making it genuinely fascinating to watch. His initial set pieces of creature-caused chaos don’t all move to the same rhythms—sometimes going for full-on destruction, sometimes pulling back for a long view that withholds the obvious money shots. Most impressively, Edwards fills Godzilla with genuinely striking images: a team of military paratroopers falling through the clouds, red flares streaming from their boots; the monstrous head of Godzilla slowly engulfed in smoke; a snarl of traffic caused by a downed jet airplane; a casino floor suddenly gone dark from a power failure, only to be exposed to unfamiliar natural light as the roof is ripped off. It was generally assumed that Edwards’ low-budget 2010 alien-invasion thriller Monsters was his audition tape for Godzilla, and he delivers even more memorable shots here when working on an exponentially larger scale. At last, of course, we do get to the battle of the behemoths, and there’s a nostalgic crowd-pleasing quality to the way this Godzilla pulls out a few of his signature moves and seems motivated only by killing the “bad” monsters on humanity’s behalf. Yet there’s an almost mythical, surreal sensibility to these creatures and their titanic showdowns, and Edwards commits to that idea even when it means not giving audiences exactly what they might expect from their contemporary giant-monster movies. People may be predictable in Godzilla, both in an archetypal sense and in a movie-plotting sense, but—amazingly enough—the way that its director serves up a familiar franchise property almost never is.